A studious historical fiction author and blogger herself, she laughed and laughed. But I was quite serious. You see, five years ago, when I started the long process of researching and writing THE DUCHESS OF RICHMOND, I found a gaping lack of information on the web about make-up throughout history. Particularly during the Restoration Period in England. There was a blog post or two. A few museum photographs. But few meaty facts. The main character of my novel was known as one of the greatest beauties at a court where both men and women wore cosmetics. Like most ladies, I myself simply love to have fun with makeup, so I considered it important to get beauty elements right in the novel. I hit the books. Thankfully, historians before me produced a number of informative guides to the topic. If you decide to follow my posts, you’ll learn lots of nitty-gritty details about cosmetics during the Restoration and through the centuries. But you’ll also find posts like today’s, where I succumb to one of my personal obsessions and talk about…you got it…lip gloss. This February I’m wearing a Bobbi Brown favorite. Naked Plum High Shimmer Lip Gloss glides on with a rich and opaque soft mauve-purple that suits green-hazel eyes. With just the right touch of shimmer instead of lacquered shine, and a hint of peppermint, it’s perfectly kissable for the month of St. Valentine’s. What are you kissing with this month? I’m quite serious about history and England. I’m quite serious about my craft and I’m oh soooooo serious about my M.A.C. lipglass. I never thought I’d love anything more than spirited lipglass or Viva La Glam VI (always makes me think of Henry VI. Go figure). But then I discovered the “wrong spell” from the Disney Villains line. It’s a dark purple with hints of copper and pink and oh so amazing. It’s from the Maleficent collection. I feel so wicked and my lips so luscious when I wear it. And since I have green-hazel eyes and I love peppermint, I might have to check out this one you are wearing. Love it, DeAnn! “Wrong spell” just made it to my to-buy list!! Sounds wonderful! Why thank you, Heather! I aim to entertain! I’m happy to be the first to comment on your blog!! How exciting! I was just looking for lip gloss today. I need a new one. I’m all out of my favorite one. Which one is that you ask? Well, Buxom Lips in LOLA thank you very much. Oh great, Lynn! 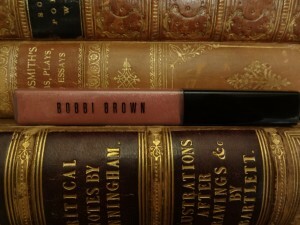 Now I have yet another lip gloss to put on my to-buy list! Thanks for commenting! Leave a Reply to Lynn Carr Click here to cancel reply.